Continue reading The Nation's Triathlon Race Report. "German director Björn Richie's film "Keep Surfing" starts with a statement by a Canadian coastguard: "making use of what you have." In Cologne-born Richie's case this was the Eisbach, a small canal flowing through central Munich behind an art museum. The canal flows over a bulge in the streambed which creates a standing wave a good meter (three feet) high and big enough to surf on. Strangely, the stream has also created a surfing culture in the middle of Bavaria. Richie's film, which took him 10 years to make, follows six friends who surf the Eisbach and further afield. 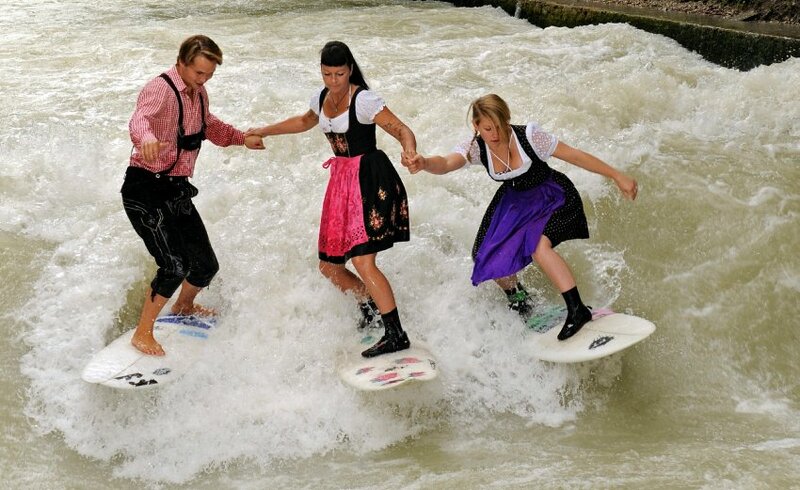 On the occasion of the film's release onto DVD on Friday, three Eisbach surfers -- Tanja, Kathi and Simon -- took to the central city wave wearing traditional Bavarian costume." Trailer (german): http://www.youtube.com/watch?v=iyMcNbWZ2jc (embedding disables...thanks Fox). As I have made my way into marathon running, triathlons, and overall fitness I am constantly on the lookout for information sources. I recently found a great one: DC Rainmaker. A fellow DMV native, his blog is an excellent source of info on products, races, and fitness. Go check it out. http://www.dcrainmaker.com/2010/09/september-garmin-forerunner-310xt.html...so check that out too.